We hope you will join us once again for this wonderful family event along Karakung Drive in Havertown. This year's event will feature living historians, live music, artists, food, a beer tent, pony rides, tours of Nitre Hall and Lawrence Cabin, and much, much more. The Historical Society is happy to feature local artisans at our event who craft their work by hand. 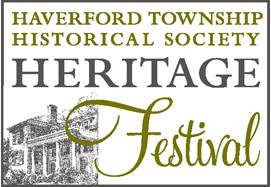 Artists and crafters who wish to reserve space at the Heritage Festival should complete the registration form available on our website. The registration fee is $30 and payment may be made online through Paypal or by check through the mail. Space is limited, so artist registrations will be taken on a first come, first served based. An email will be sent to confirm your participation after we receive your registration form and payment. Load in and set up for festival participants occurs between 8 and 10 am on Sunday, June 7. All traffic must enter Karakung Drive from Manoa Road. After 10 am, all vehicles must be moved outside the boundaries of the festival until after it ends at 4 pm. The Historical Society appreciates the support and partnership of our festival participants. We are proud to showcase the skills and talents of our greater community. We hope you will join us for this year's Heritage Festival!